The Burgman line has always been about classy and comfortable commuting, and the factory seems to have found a sweet spot here with its largest displacement version that brings comfort, convenience and safety to the table. As a “maxi-scoot,” the Executive delivers a motorcycle-like riding experience with amped up scooter features that give it something of an exaggerated look, so clearly, this is a vehicle of extremes. Suzuki carries over its Burgman 650 Executive with a new color for MY2018, so let’s check this ride out and then see how it stacks up against one of the top office-scooters to come out of Europe. Continue reading for my review of the Suzuki Burgman 650 Executive. Back in the lineup in 2018 after a hiatus the year prior, the Burgman 400 emerged as an all-new, third-generation model available for the North American market. A new powerplant delivers over 30 horsepower, and it comes tucked away under a restyled body. Mature, modern looks greet the eye as Suzuki rolls its business-tastic Burgman 200 over into MY2018. In spite of its diminutive powerplant, the Burgman 200 carries itself with a definite maxi-scoot appeal. Motorcycle-like suspension components and safety equipment boost its commuter capabilities with an increase in overall ride quality over your typical [scooter->mot-type vehicle, so yeah, this ain’t your typical 200. Let’s dig in, shall we, and see what else the littlest Burgman has going on under the hood. Continue reading for my review of the Suzuki Burgman 200. 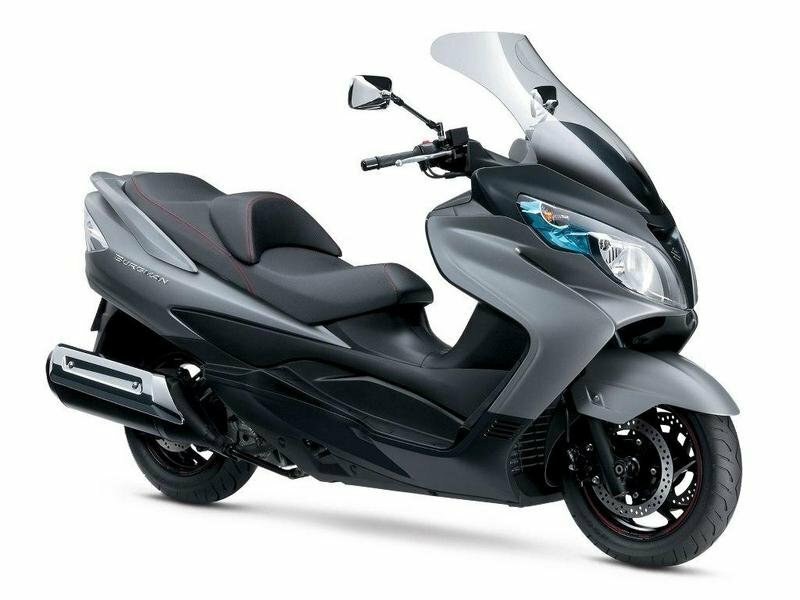 Largely carry-overs from previous years, the Burgmans in Suzuki’s dwindling 2017 lineup — called Skywave in Japan — consists of the 200 and the 650 Executive. Missing is the Burgman 125 available outside the U.S. market and the Burgman 400 not brought forward for 2017. Styled for classy good looks and a certain amount of sophistication, the Burgmans present a scooter that demands to be taken seriously in an otherwise ’wild spirit’ or retro-style scooter market. Continue reading for my review of the Suzuki Burgman. 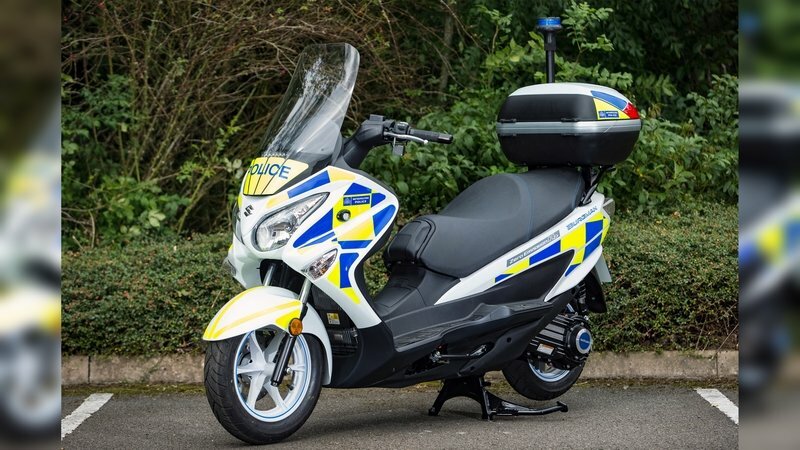 A trial to test Suzuki’s hydrogen-powered Burgman scooters launched on September 4, 2017 with the Metropolitan Police’s Fleet Services in London. 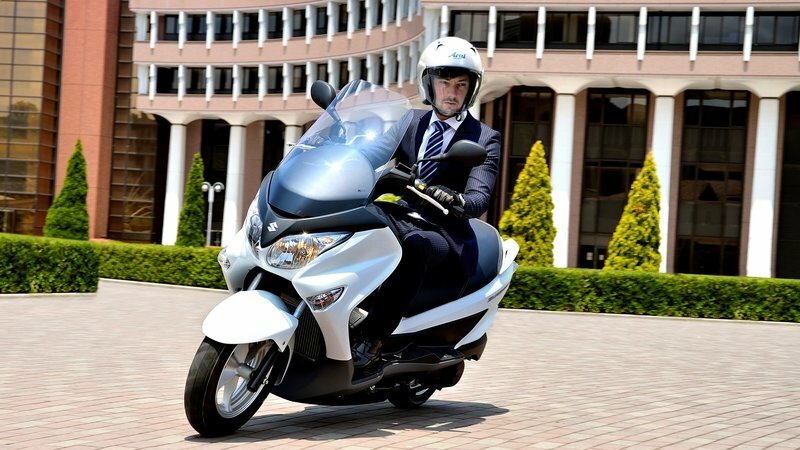 On trial are seven Suzuki Burgman scooters equipped with the “Burgman Fuel Cell.” The cell is an integral part of a zero-emission hydrogen fueled scooter that is part of a green movement to reduce the city’s dependence on fossil fuels. The folks at the Met aim to have 550 green vehicles by 2020 and these scooters will go toward testing the viability of the hydrogen cell. The Burgman Fuel Cell was developed as a joint effort between Suzuki and Intelligent Energy Ltd, a provider of clean power technologies that aims to meet the market demand for more environmentally-friendly products. Continue reading for more on the Burgman Fuel Cell. 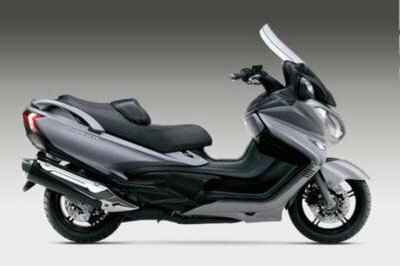 A carryover from 2014, the Burgman 200 available from Suzuki for 2017 remains that awesome around-town ride or a super-scoot up the highway. With plenty of roll-on even at highway speeds, good fuel economy and a suspension that’s more motorcycle than scooter, the Burgman 200 takes daily commutes in stride. The low center of gravity gives it responsive handling, giving you a surprisingly powerful ride for such a small scooter. When it comes to maxi scooters, the Suzuki Burgman 650 Executive ABS is without a doubt one of the most wanted models in its class. Featuring a wide range of accessories and powered by a 638 cc, 4-stroke, 2-cylinder, liquid-cooled, DOHC engine the Suzuki Burgman 650 Executive ABS promises to be a lot of fun both in the city and on the open road. 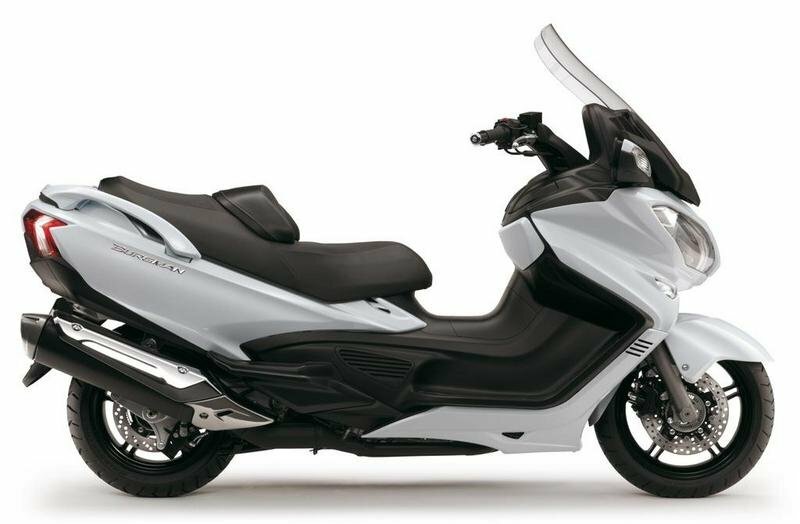 Among the features offered by the Suzuki Burgman 650 Executive ABS you’ll find heated seats and grips, ample storage places and an adjustable protective front screen. Moreover, you even get a power socket, front and rear disc brakes and a large 15.0 litres fuel tank. As far as prices are concerned, the Suzuki Burgman 650 Executive ABS can be yours for no less than €10.839. Hit the jump for more information on the Suzuki Burgman 650 Executive ABS. 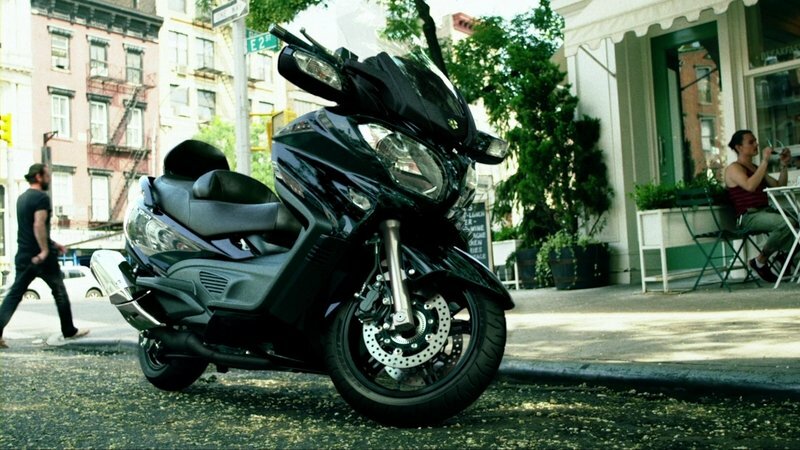 Luxurious and spacious, the 2014 Suzuki Burgman 650 ABS is a maxi scooter designed for those who want the comfort offered by a scooter and the performances of a big displacement engine. Talking about the engine, the 2014 Suzuki Burgman 650 ABS is offered with a 638 cc, 4-stroke, liquid-cooled, 2-cylinder, DOHC engine which is paired with an automatic transmission. The scooter is built on a tubular frame and an aluminum-alloy swingarm which allows the engine to be mounted in a forward position for enhanced maneuverability. You also get a capable suspension system that delivers 110 mm front and 100 mm rear wheel travel further improving the scooter’s agility. 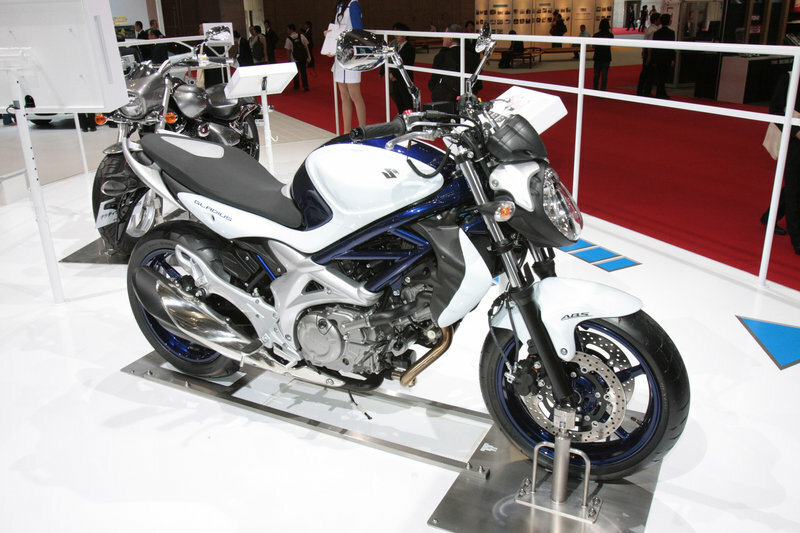 The 2014 Suzuki Burgman 650 ABS rides on 120/70R15M/C 56H front and 160/60R14M/C 65H rear tubeless tires. The stopping power is handled by twin disc up front and rear discs paired with ABS. Hit the jump for more information on the 2014 Suzuki Burgman 650 ABS. 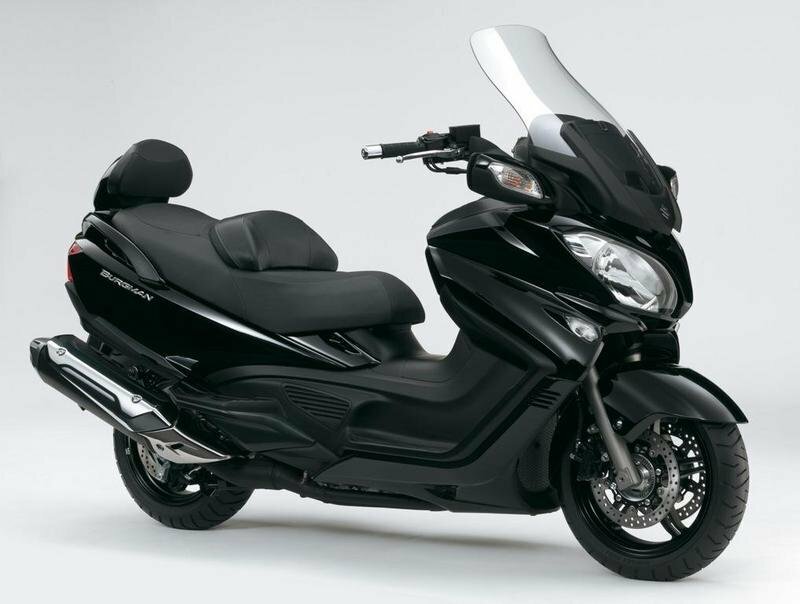 The 2014 Suzuki Burgman 400 ABS is a modern scooter that delivers a high level of comfort, great efficiency and a good maneuverability. The scooter sports a 400 cc, 4 stroke, liquid cooled, single cylinder, DOHC engine which is brought to life by an electric starter. The engine is fueled by a 3.5 gallons fuel tank and is brought to life by an electric starter. Its power is kept in leash by a CVT automatic transmission. The 2014 Burgman 400 ABS comes with a big, illuminated storage bay which is large enough for two full-face helmets and a smaller compartment for personal items. You also get an antilock Brake System (ABS) that monitors wheel speed, and matches stopping power to available traction. The ABS is combined with twin disc brakes up front and rear discs at the back. 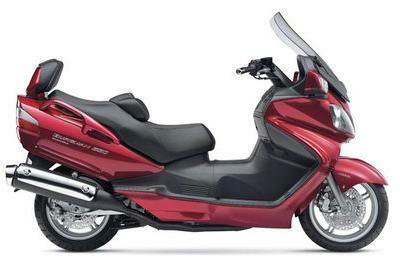 Hit the jump for more information on the 2014 Burgman 400 ABS. 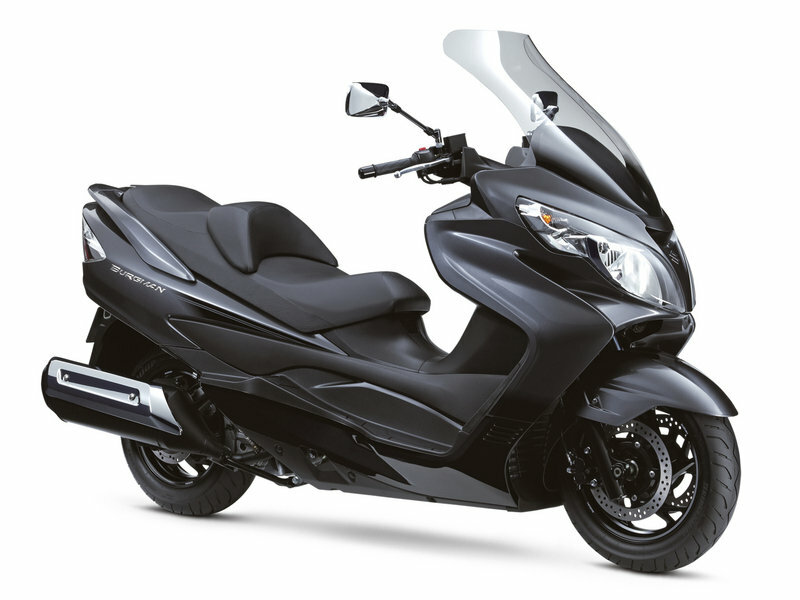 Suzuki has taken the wraps off its new Burgman 200 ABS. The scooter is the smallest model in the Burgman lineup and shares many common elements with its bigger sibilings – the Burgman 400 and Burgman 650. The scooter weighs only 163 kg and is propelled by a 200cc, 4-stroke, liquid-cooled, single-cylinder, OHC engine which puts out 18 hp and 18.8 Nm of torque. The engine is mated to a smooth CVT transmission. As far as ergonomics are concerned, the Burgman 200 features a spacious seat with a generous storage box underneath it that is big enough to swallow 2 helmets. The ride quality is assured by telescopic front forks (33mm inner tube diameter) and rear twin shock absorbers that feature spring pre-load adjustments. The scooter’s speed is kept under control by a set of 240mm front discs with 2-piston calipers and 240mm rear discs with single piston calipers. 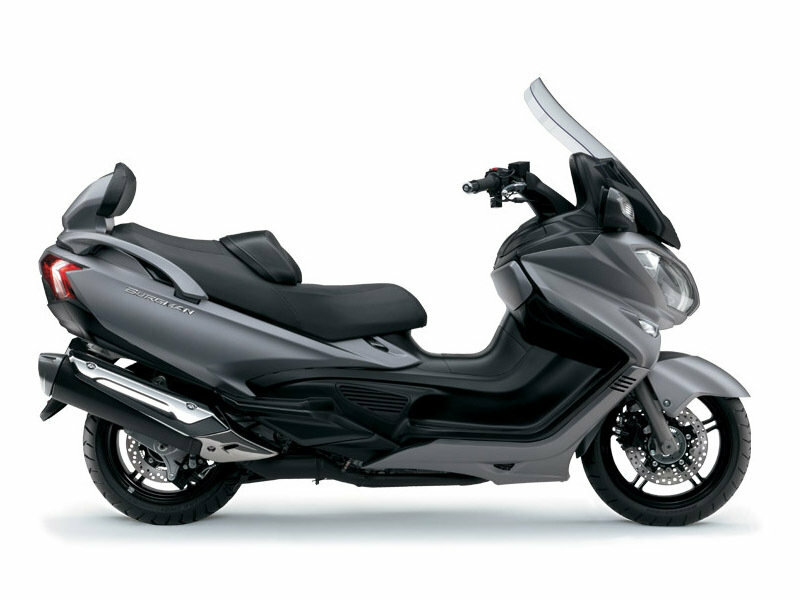 Hit the jump for more information on the 2014 Suzuki Burgman 200 ABS. 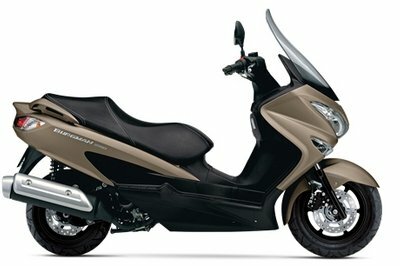 If you are searching for a capable and reliable scooter then you should take a closer look at the 2013 Suzuki Burgman 200. This Japanese scooter was built with comfort and practicality in mind so you are treated with a spacious seat that covers a generous storage place, an ergonomically designed handlebar, a big windscreen and roomy foot rests. 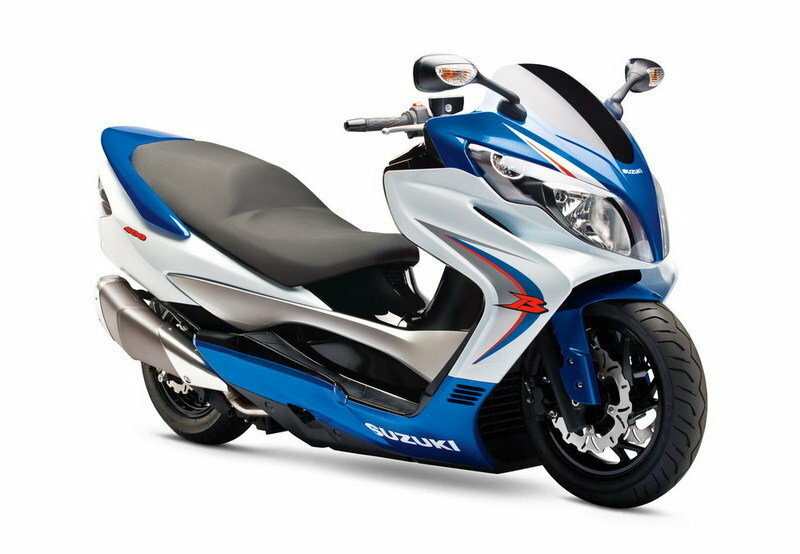 In terms of power, 2013 the Suzuki Burgman 200 is propelled by a 200 cc, 1-cylinder, liquid cooled, SOHC, 4-stroke engine mated on an automatic transmission. The engine was especially tuned for efficiency and is fed by a 11 litres fuel tank. The stopping power is assured by linked front and rear hydraulic disc brakes that automatically adjust the braking force between the front and rear to help you stop more efficiently. 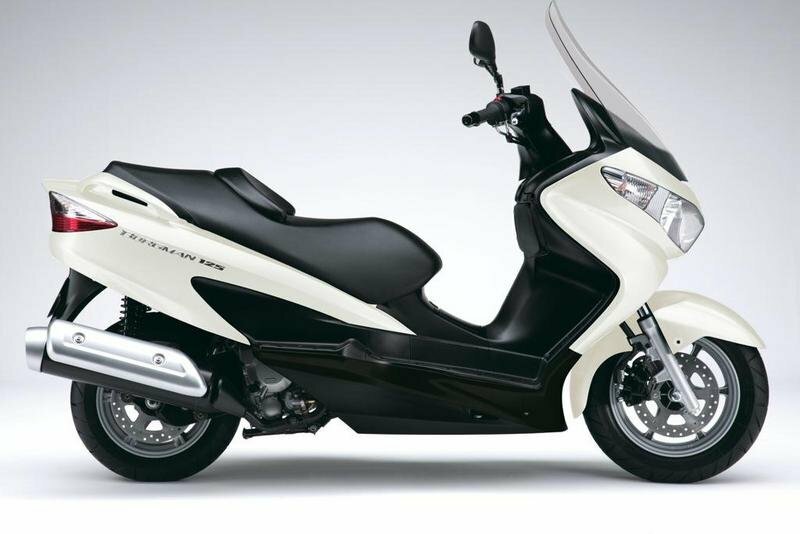 The Suzuki Burgman 200 is offered with a starting price of £4,085. Hit the jump for more information on the Suzuki Burgman 200. The Suzuki Burgman 125 is a small scooter that measures 2055 mm (80.9 in) long and 740 mm (29.1 in) wide. Despite being small, the Suzuki Burgman 125 is pretty agile thanks to its 125 cc, 1-cylinder, liquid cooled, SOHC, 4 stroke engine which offers a decent amount of power and torque. The scooter features aerodynamically designed bodywork that apart from looking cool it also offers a good weather protection. You also get a spacious seat and a sporty handlebar which work together to offer a fairly relaxed riding position. The stopping power is assured by linked front and rear hydraulic disc brakes which help you offer sharp performances by automatically distributing the braking force between the front and rear. The scooter rides on relativelly small 110/90-13M/C 56P front and 130/70-12 62P rear tubeless tyres. The Suzuki Burgman 125 can be yours for £3,465. Hit he jump for more informaiton on the Suzuki Burgman 125. 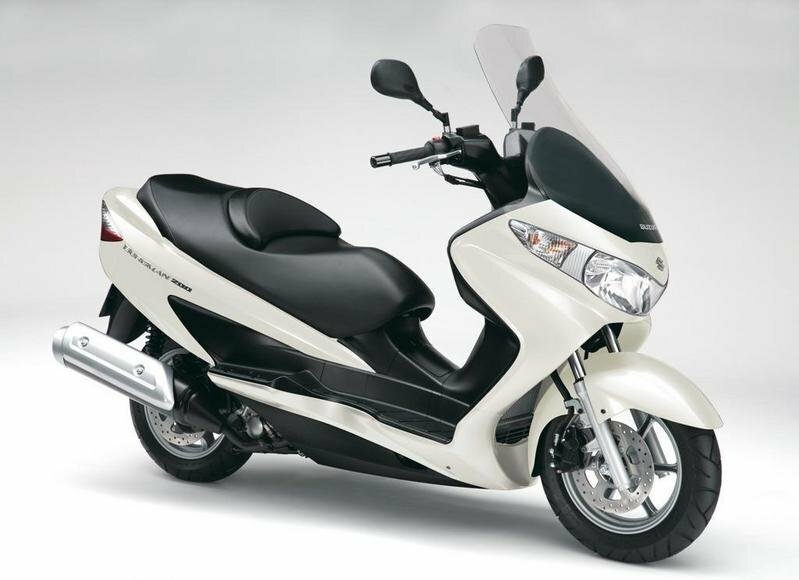 The Suzuki Burgman 400 ABS is a sporty scooter that puts comfort and practicality on top of its priorities list. It was built around a 400cc, 4-stroke, liquid-cooled, single-cylinder, DOHC engine which sends its power to the rear wheel through an automatic transmission. The Suzuki Burgman 400 ABS comes with a spacious seat, an adjustable backrest, a pretty big windscreen and a plush suspension that gives you a hassle free riding experience. Once on board you are met by an easy-to-read instrument panel that includes a speedometer, tachometer, odometer, twin tripmeters, clock, indicators for the ambient temperature, average fuel consumption, fuel level and coolant temperature. The stopping power is handled by twin front discs paired with a rear disc brake and an ABS system. 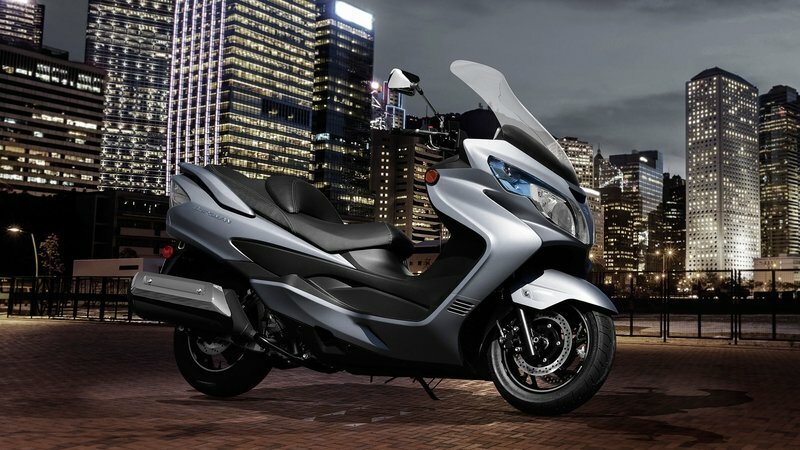 The Suzuki Burgman 400 ABS is offered with a base price of $7,899. Hit the jump for more information on the Suzuki Burgman 400 ABS. The Suzuki Burgman 650 ABS Executive is a large scooter fitted with luxury features. It offers an interesting mix between motorcycles and scooters rewarding you with a generous acceleration without sacrificing the comfort. Talking about acceleration, the Suzuki Burgman 650 ABS Executive is equipped with a 638cc, 4-stroke, 2-cylinder, liquid-cooled, DOHC engine that sends its power to the rear wheel through a modern SEVCT transmission. Once on board you are met by a height adjustable and heated seat, a modern handlebar, heated grips, a large, electronically adjustable windscreen and lots of storage places. The stopping power is assured by twin discs up front and a rear single disc. Needless to say that you also get a modern ABS system that further enhances the safety. The Suzuki Burgman 650 ABS Executive is offered with a starting price of £8,799. 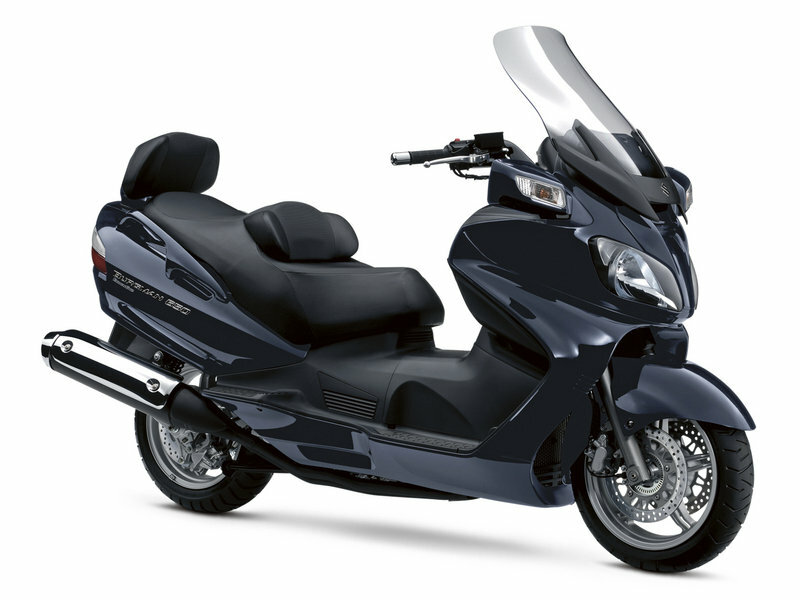 Hit the jump for more information on the Suzuki Burgman 650 ABS Executive. 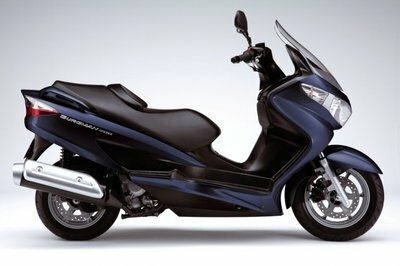 For a scooter, the 2013 Suzuki Burgman 400Z ABS is a pretty imposing presence. It features a large saddle that can accommodate effortless two people, a modern handlebar with handguards and a large protective windscreen. Moreover, you also get heated grips and a passenger backrest as standard. As far as storage places are concerned, the 2013 Suzuki Burgman 400X ABS offers a large 62 litre under-seat storage and a lockable front console with DC outlet. The 2013 Suzuki Burgman 400X ABS was built around a 400 cc, 4-stroke, liquid cooled, DOHC engine which sends its power to the ground through a SECVT transmission. Thanks to its capable engine, the Suzuki 400Z ABS can deal great with high way speeds, but also with city traffic. The Suzuki Burgman 400Z ABS is offered with a starting price of £ 6,399. Hit the jump for more information on the 2013 Suzuki Burgman 400Z ABS. One of the major players in the luxury scooters segment is the Suzuki Burgman 650 ABS. This modern scooter is packed with a long list of useful features especially designed to give you better performances and improved comfort. For 2013, the Suzuki Burgman 650 ABS has received a few upgrades which make it slightly better than the previous generation. Among the changes made for the 2013 Suzuki Burgman 650 ABS you’ll find a modified transmission that improves the fuel efficiency with up to 15%. You also get new front brakes and a fresh exhaust system. The Suzuki Burgman 650 ABS is built around a 638cc, 4-stroke, liquid cooled, 2 cylinder, DOHC engine that has also received a few tweaks which help it deliver better overall performances. 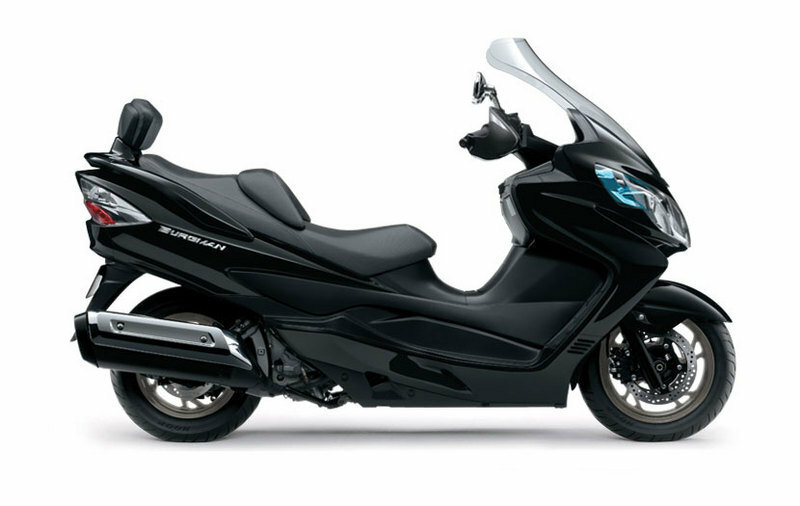 The Suzuki Burgman 650 is offered with a starting price of $ 9,799. Hit the jump for more information on the Suzuki Burgman 650 ABS. We find it extremely difficult to pick a scooter without taking second or third glaces at the Suzuki Burgman 400 because there’s something about this scooter that just draws us in. Maybe it’s the aesthetic design, which we’re really high on because it looks smooth and futuristic. And that’s not even taking into account all the notable design qualities it has, including the new pinstripe decals on the front and rear wheels; the front bodywork that contains three covered storage compartments, including a large 10-liter compartment and two smaller compartments above it; a convenient DC power outlet that allows you to charge electric devices while on the move; abundant luggage space that features a huge storage bay large enough for two full-face helmets and a smaller compartment for personal items; a comfortable well-padded seat with a backrest that’s adjustable in five 10mm increments at the press of a lever; and finally an easy-to-read instrumentation includes a speedometer, tachometer, odometer, twin trip-meters, clock, indicators for the ambient temperature, average fuel consumption, fuel level and coolant temperature. Then there’s the matter of the powertrain. 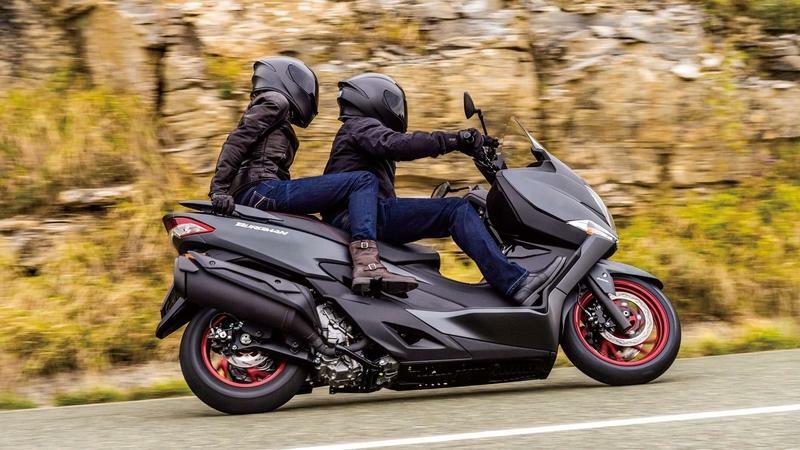 The Burgman 400 carries a 400cc, 4-stroke, single-cylinder, liquid-cooled, DOHC, fuel-injected engine that was designed to produce broad, useable power with quiet operation and low maintenance. It is matched up to a CVT transmission that helps in carrying instantaneous punch while going off the block. Suzuki also added an electronic Idle Speed Control (ISC) that helps improve cold starting, reduces cold-start emissions, and stabilizes engine idle under varying conditions. All told, the Suzuki Burgman 400 ABS provides an ample amount of power, handling, mileage, and, strangely enough, storage space that makes it increasingly difficult to pick another scooter over this one. Find out more about the Suzuki Burgman 400 ABS after the jump. The words ’scooter’ and ’executive’ aren’t usually associated with one another, but in the case of the Suzuki Burgman 650 Executive, certain exemptions have to be made. Relative to its market, the Burgman 650 Executive rolls like a boss and comes packed with plenty of up-standard features that other scooters only dream of having. From the choice between a Pearl Moon Stone Gray or Pear Mirage White paint finish all the way to its enormous proportions, the Burgman 650 Executive has definitely earned that ’Executive’ name. Much more than it aerodynamic and ergonomic design, the Burgman 650 Executive also packs an impressive powertrain in the form of a powerful, liquid-cooled, 638cc, DOHC, 8-valve, twin-cylinder engine that features Suzuki’s fuel-injection system and vibration-reducing dual counter balancer shafts to provide smooth and powerful acceleration befitting its stature as one of the most polished scooters on the market. Although it looks the part of the scooter, the Burgman 650 Executive feels more like a bike that knows its business all the way around. This posh scooter also comes with a smooth, responsive chassis and suspension set-up featuring a tubular frame and aluminum-alloy swingarm that allows the engine to be mounted in a forward position for excellent balance and agility. Telescopic front forks with 41mm inner tubes provide 4.3" of wheel travel for sport performance and a comfortable ride while an aluminum swingarm-style rear suspension system features twin preload-adjustable shock absorbers offering 3.9" of travel. 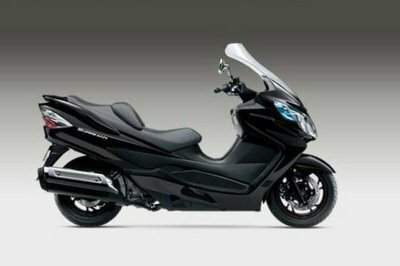 Any which way you look at it, the Suzuki Burgam 650 Executive is about as awesome a scooter as you can find anywhere. It’s striking combination of looks, handling, and performance makes it a must-have for all riders out there. Find out more about the Suzuki Burgman 650 Executive after the jump. 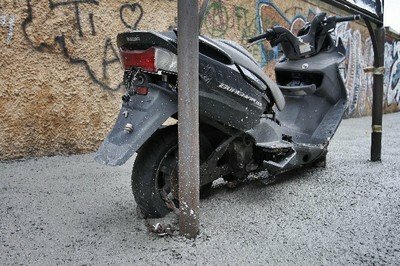 This Suzuki Burgman 125 scooter is clearly having a bad day as the owner left it parked on the sidewalk and then workers came to pour concrete all over the place. It seems that the thing is now an integrated part of the Via del Porto Fluviale in Rome. Hmm, last time I checked, Japanese scooters weren’t an ingredient of Roman concrete. Searching the web, we’ve come across this beautifully styled Suzuki Burgman 400 which is a scooter replica of Suzuki’s road racing lineup. At a first glance there really isn’t anything not to like about the recently unveiled concept at a Las Vegas Suzuki conference. Like the GSX-R series, it features an aerodynamic front end characterized by perfectly integrated headlights, signal lights as well as air scoops, everything being adapted to the fairly bigger scooter front end. The seat is extremely spacious and the passenger’s handles unite into what replicas a racing rear end on top of the scooter one. There are also performance additions to the quiet, fairly small machine that often finds its purpose of life underneath modern European couples. These are the powerful brakes featuring waved discs and the exhaust which, like on the GSX-R models, have that nice triangle shape and follow up the machine’s design lines. God knows what they’ve done to the engine, but as far as we can see, the road behavior has been improved by lowering the concept scooter while the color scheme is exactly like the one of the bike that inspired its creation in the first place. Now, I love super sport bikes and everything that has to do with them, but if you can come up with a plausibly reason to why would anybody wish such a transformation, I am ready to accept it. Until then, I find no reason for it to go into production as it isn’t practical at all…though I would love to swing a leg over it during a day at the track. Get ready for the ride of your life - on the stylish Burgman 650 Executive, it has all the great features of the Burgman 650 with ABS, an electic adjustable windshield and a passenger backrest.